Amazon placed reviews for a novel by the founder of scientology on to the page for a new book on Donald Trump, according to tech news site Gizmodo. “I found Fear to be the biggest piece of garbage I have ever read,” one reviewer of L Ron Hubbard’s Fear had written in 2000. This and other reviews of the novel were briefly linked to Fear: Trump in the White House, by Bob Woodward. The BBC has contacted Amazon for comment. L Ron Hubbard published Fear, a horror-thriller, in 1940. It follows James Lowry, a university professor who believes he is being haunted by supernatural beings or demons. 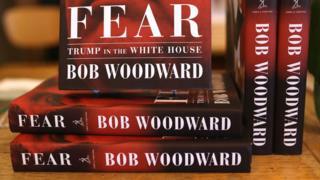 Woodward’s expose on the Trump White House is currently a bestseller, having sold 750,000 copies on its first day. It contains a number of quotes from White House staff criticising Mr Trump’s handling of the presidency. “We’re in Crazytown. I don’t even know why any of us are here. This is the worst job I’ve ever had,” Chief of Staff John Kelly is reported to have said. The reviews mix-up appears to have now been fixed.